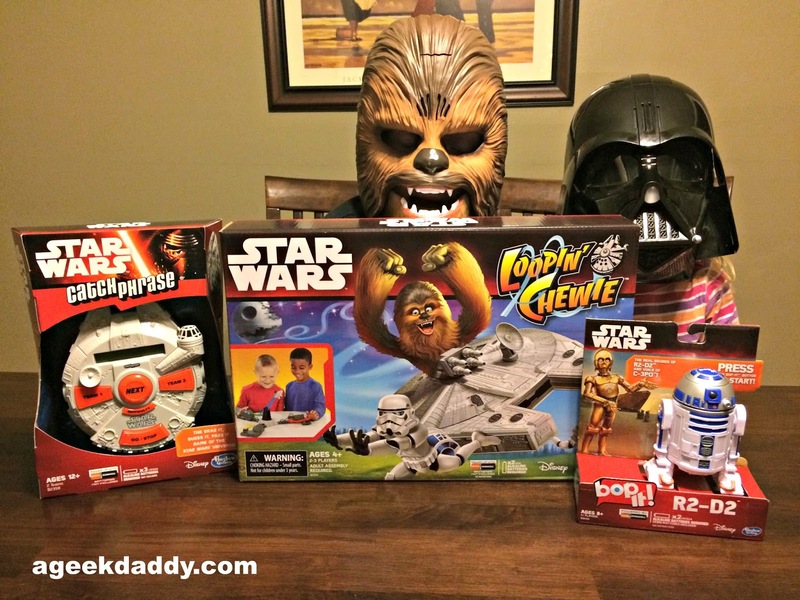 We try to devote an evening each week for either a family movie watching or game night, but recently we combined those two themes to enjoy a Family Fun Night playing some great Star Wars games from Hasbro. My passion for Star Wars has rubbed off on my kids so our whole family was excited about having some fun playing games like STAR WARS LOOPIN' CHEWIE and STAR WARS R2-D2 BOP IT! Thanks to our friends at Hasbro, we're also sharing our excitement about these great games by giving away a huge prize pack of Star Wars games to one lucky A Geek Daddy blog reader. Both of my children really had fun with Loopin Chewie which we played for over an hour during our Family Fun Night. While my son tends to be more of the Star Wars fan of my two kids, the competitive side of my daughter really came out as she faced off against her brother and parents - she had such a blast playing this game I don't need the Force to foresee us playing Loopin Chewie a lot more in our future. 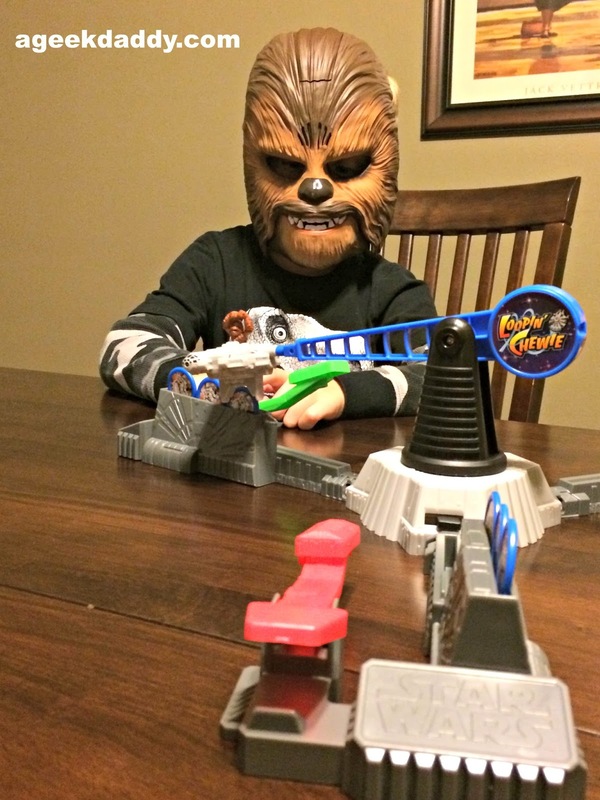 One of the most recognizable characters from the Star Wars saga, Chewbacca, has been combined with the wild fun of Hasbro's popular children's game LOOPIN' LOUIE to bring zany, fun-flying action from a galaxy far far away to your home right now. 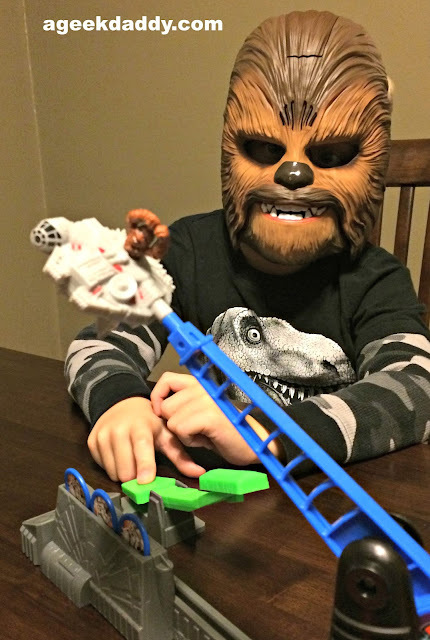 Recommended for ages 4 & up, players must help CHEWIE co-pilot the MILLENNIUM FALCON by sending him swinging straight into the STORMTROOPERS on the other players racks. Use the lever in front of you to knock the Millennium Falcon away from your rack of stormtrooper helmets as it soars around the play area while trying to swing it into your competitors rack. Time when you hit the lever just right and you can really get Chewbacca flipping the Millennium Falcon around. The last person with a stormtrooper helmet not knocked over is the winner of LOOPIN' CHEWIE! Another game our whole family enjoyed was BOP IT! STAR WARS R2-D2 Edition Game. Since we got this game there have been a few times I've been at home and heard R2-D2 chirping in the other room to find my wife playing this game. In this game where you have to quickly follow instructions to bop it, twist it or pull it my wife has gotten up to 62 repetitions. Impressive, most impressive especially when I average about twenty before messing up and my daughter is at about eight. 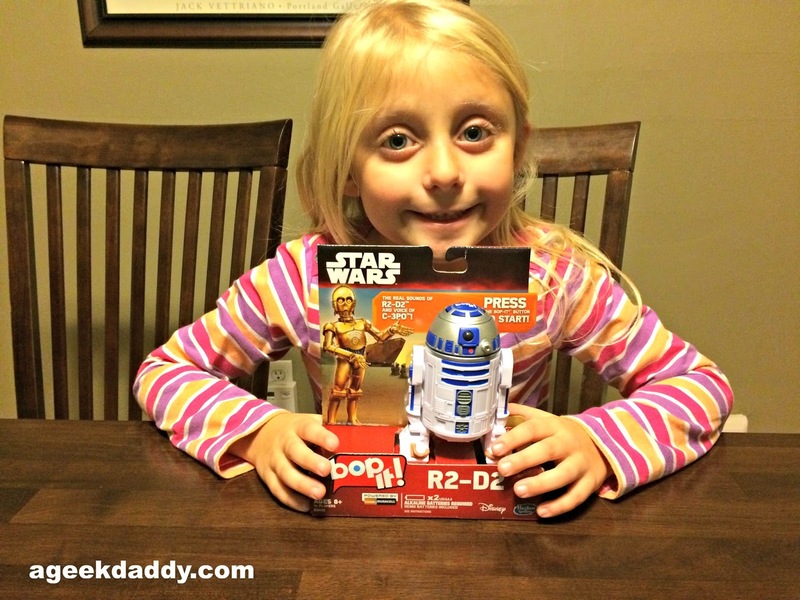 My daughter has really latched onto this R2-D2 Bop It! game not only because she likes playing the game but it is also a sturdy built model of the droid and has great sound effects to also make it perfect for just playing pretend Star Wars adventures with her other toys. Just like the classic BOP IT! game, players must twist, bop, and pull the R2-D2 figure in response to his commands to be the last JEDI standing in this fun and fast reactionary memory game. The BOP IT! STAR WARS R2-D2 Edition Game which is recommended for ages 8 and up features STAR WARS movie sounds and the voice of C-3PO. If this cool toy has caught your attention note that it is exclusively available at Wal-Mart. I honestly have to say this is one of the best Star Wars branded items I've come across recently and if you are shopping for a fan this is something that is sure to delight if you pick it up for them. For your chance to win more than $100 of Star Wars games from Hasbro including Electron Catch Phrase: Star Wars Edition, Star Wars Loopin' Chewie game, Monopoly: Star Wars Edition, Risk: Star Wars Edition, and Bop It! 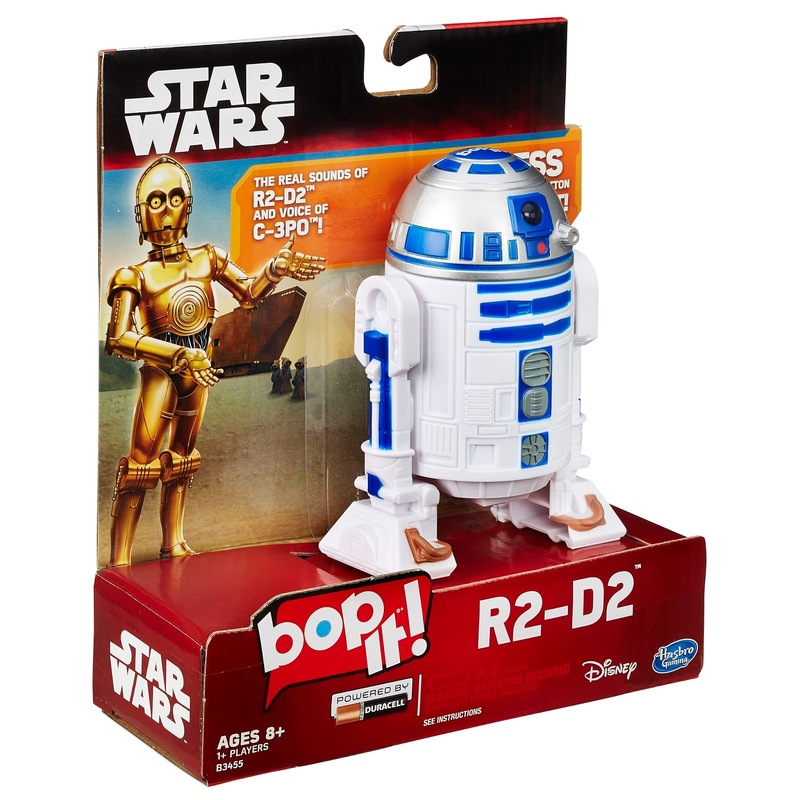 Star Wars R2-D2 Edition submit one or both of the following entry methods to earn up to 2 entries prior to 11:59 pm EST on Friday, December 11, 2015. Must be a US resident over 18 years old to win. Follow @Geekdad248 on Twitter. E-mail thegeekdaddy [at] yahoo [dot] com your name, mailing address, and twitter handle. Must be following our account on Twitter at the time winner is selected to be eligible to win. Email subject line should be BOP IT! Visit our Facebook page and on the contest post leave a COMMENT telling us which of Hasbro's Star Wars games is your favorite. Find out who the biggest Star Wars fan is in this classic party guessing game shaped like a Millennium Falcon! 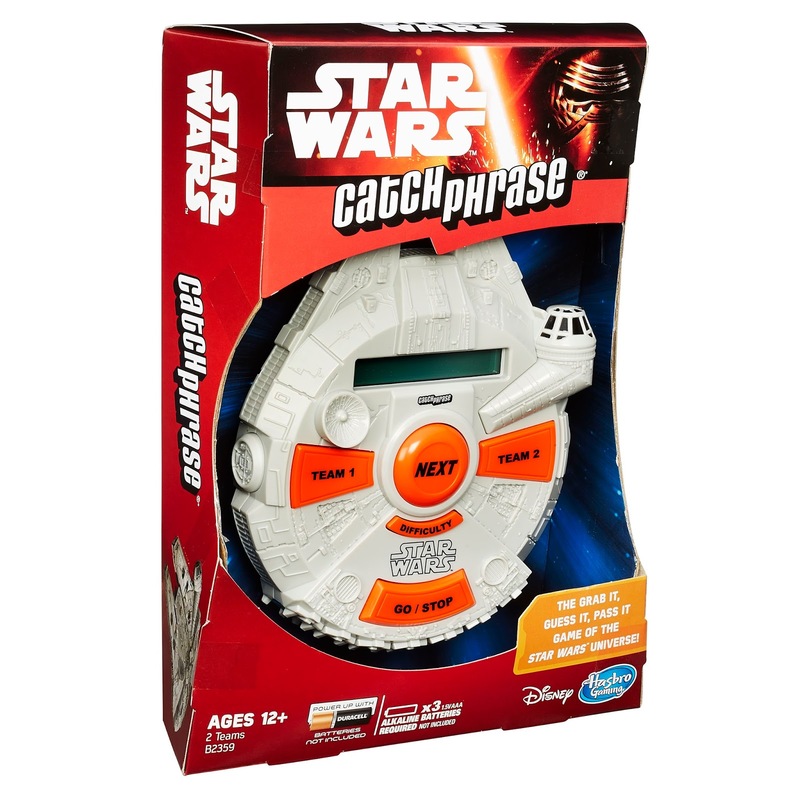 Recommended for ages 13 and up, players choose a difficulty level and test each team's trivia skills and speed by describing the Star Wars phrases as they appear on the device. Shout, gesture, and say anything but the words in the answer to help your team guess correctly before time runs out. Lead a fleet, take a risk, and rule the world! In this Star Wars themed RISK game, players must rally stormtroopers and other notable Star Wars characters in a strategic, skilled fight to rule the galaxy. 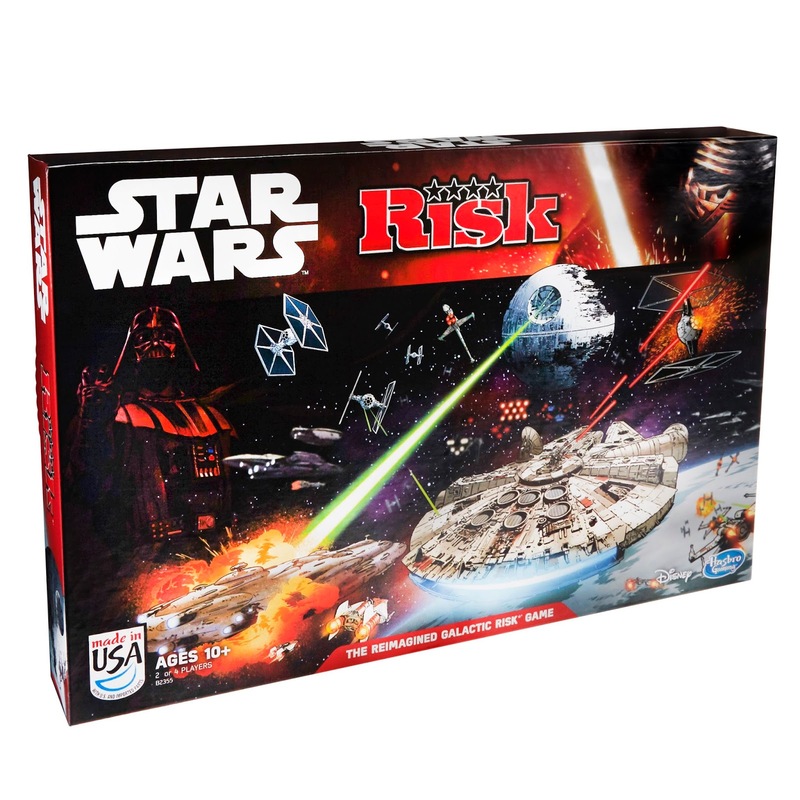 Recommended for 10 years and older, RISK is always a great game to entertain 2 to 4 players. The classic buying, selling and trading MONOPOLY game is headed to space just in time for the release of STAR WARS: THE FORCE AWAKENS. Travel around the galaxy and build bases on planets. When every planet is owned, count up the bases. The player with the most bases is the ultimate winner! 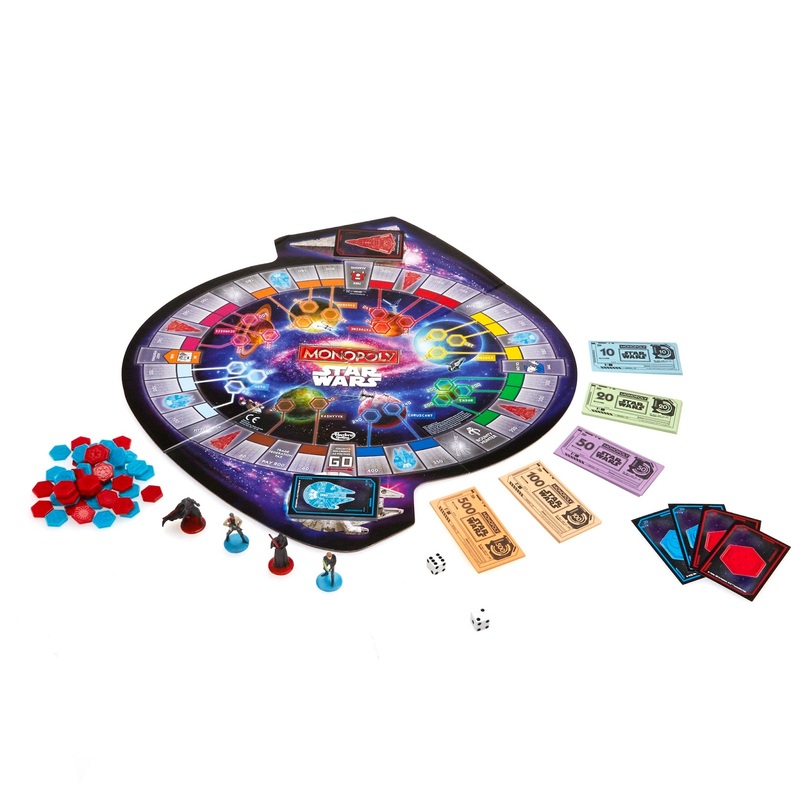 The MONOPOLY: STAR WARS Edition Game includes 1 game board, 4 tokens (including 2 characters from "The Force Awakens" introduced in this set), 44 Bases (22 Rebel, 22 Empire, all double-sided), 18 Rebel Force Cards, 18 Empire Force Cards, 4 Character Cards, 2 Dice, and 1 Money Pack. Good luck to all our entrants for this incredible Star Wars game prize pack from Hasbro. May the Force be with you! DISCLAIMER: A Geek Daddy Blog will be responsible for selecting the winner of this contest, but Hasbro's public relations agency is responsible for fulfillment and delivery of the prize. By participating in this contest you waive any liability towards A Geek Daddy Blog or its publisher that may arise from your involvement with this promotion. While we are sure your prize will arrive A Geek Daddy is not guaranteeing delivery. If you win this prize on another blog, you will not be eligible to win again. Winner is subject to eligibility verification. Prize will be delivered by UPS or FedEx so no P.O. Boxes are allowed as mailing addresses. Prize will only be shipped within the United States A Geek Daddy Blog did not receive any financial compensation but did receive complimentary products to review for the blog and the prize that is being awarded to one of our readers for this contest. A Geek Daddy Blog is hosting this contest as a benefit to our readers. Any opinions in this post are my own. Sounds like a fun game night! I can't wait for the new Star Wars movie. Looks like a great night with some fun games. I'm about ready to do a Star Wars marathon to get ready for the new movie. Now if I could just find the time. lol! Thanks for sharing. These games are so fun. My girls especially liked the new Bop It! Awesome cool games and toys. Love to have them too! I've never seen a star wars moving...i'm waiting for my son to be old enough to watch it with me! The bop it game looks like a lot of fun, I think my daughter might like it. Thanks for posts, I didn't know these games existed until this post. I entered on FB and through email. FINGERS crossed! Can't wait to see it. The Star Wars marketing for this movie is outta control--products are everywhere! This is pretty awesome! All of those games look great and I love me some Star Wars! I've been meaning to start setting up couple's game nights periodically because I love playing board games.